It is a normal phenomenon that human beings take most of the simple things for granted. 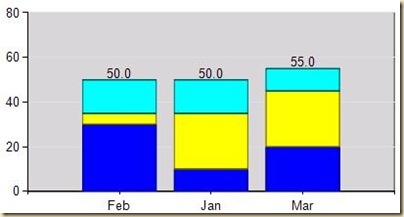 Take this case, one of my blog readers sent me a mail asking how to display the total on top of a stacked chart in SSRS. The first time I read it, I was almost going to blurt – just enable some property to display subtotals. But the more I thought about it, the more elusive the property became and that is when I realized there is no such property. So for the benefit of all, I thought about posting the workaround that I devised for this. Suppose I have a simple stacked column chart with Month on Categories, Product Category on Series and Sales as the measure. The requirement is to display the total of all Product Categories for a month on top of the stacked column chart. The required output is shown in the below image. This is done to include an extra row called Total for Product Categories. The value for Sales for this row would be 10% of the total Sales of that month. 2) Go to the Design tab, right click on the chart and enable the Show Data Labels option. Then select the series label properties by right clicking on the data labels. The above expression displays blank if the Product Category is not “Total” and displays the sum of the entire Product Categories for that month (including the value for Total) – sum of the Total field. P.S. : “Chart1_CategoryGroup” would have to be replaced with the category group name of your stacked column chart. To find this, click on the Month (category) button in the chart and press F4. You will find the Name of the group in the property panel that opens up as shown below. 4) Now we should be getting the following output when we click on the Preview tab. This is done so that the Total value will not appear in the legend. 5) Right click on the stacked columns and select series properties. This is done so that the Total value will be transparent and hence, would look like it is not present. This report has been done with SSRS 2008 R2 but the concept should work in SSRS 2008 more or less the same way. Right now, there are only 14 colours in the palette but more colours can be added if you have more than 14 values in the series. 2) Use the following expression for colour in the fill tab of series properties. Jason Thomas this is a blog that is worth plenty! I would like to thank you for this blog that has instructed me on how to implement a total at the top of each stack in a column stack chart. You are a life saver! I hope that the Development Team at Microsoft can read your blog so that they can see how creative you have to be to be able to place a total at the top of each stack, this would be a common requirement in most companies that wish to create column stack type reports and I hope that Microsoft will make this option easier to implement in future releases of Reporting Services. Once again, thank you very much Jason, a blog well done! I look forward to future blogs that you develop. Hey your blog helped me a lot. However, I would like to display values of each stack on top of the bar and then total of the bar totally above all the values. Do you have any suggestions? Do you have an image which shows how you would like to see the chart? But how can I attach the screen here? I have uploaded on mega upload. Could you please download from there and see? @Priyanka : We can't make it exactly as you said (not possible to get the labels in a coloured textbox) but I have mailed you a possible workaround. Let me know if that would do. I would also be interested in how you were able to get this to work. @Scott : Could you be more specific? Is it also possible to work around with the Fetch XML ,to show the Total Counts on a Field in Stacked Bar chart. I think I have a bit simper solution for the same thing. (Figured out this afternoon after finding yours.) It doesn't require you to change the query which makes it more convenient and also you need less properties to be replaced with expressions and the expressions themselves are less complex. 4. Check "Show data labels" of the new series marked. 5. Change the position of the labels to top. I agree, I also had found this solution after a couple of months of blogging this. Actually, this is the technique I show whenever I present my session – "Advanced Charting Techniques in SSRS" (this scenario is one of the many snippets I present in that). Jason and Hu, THANKS!! Great solutions! Step 6 is unnecessary. Just Disable the SmartLabels. The labels then must all appear in exactly the same place and you can’t see that there is more than one. Hi Jason, I have stacked bar chart. I want to display percenatges in x axis. I have calculated to display the percenatges to be shown in data lables. This is the formula I have used.in Chart series Lables => =CInt(Count(Fields!Status.Value)) / CInt(Count(Fields!Section.Value,"Chart3_CategoryGroup")). But I have issue with x axis formatting. The bars are not in sync with the x axis values. How do i format the x axis and bars so that the values are in sync. 1) the solution handles the visibility problem of the series label (i.e each group in the series group will have the respective total value displayed. therefore if there are 3 groups, 3 times the total value will be displayed) effectively by displaying only the max of series group for a particular category. therefore only the max value is shown. In my case there are 3 groups in the series group and for a particular category group there is value only for one of the groups. At that instance this max concept is not working. It still displays the total value 3 times. Please let me know what I should do here. 2) it would be great if I could know how to customise the labels as it displays both the series name as well as the total column name. You can customize the labels by going to the legend properties and using the custom text (where you can say to only display the field name you want instead of both). As for the first problem, you might have to use some expressions to achieve the same, I can help you further if you send me an rdl to jason143@gmail.com with a simulated example. Thank you for your article. The total is not displaying at the top of stacked column. it displays at the center for that particular stacked total graph. Will it possible to include indicator like triangle pointing upwards and show the total above that triangle. Could you please guide me with that? If you followed this article, the total should appear at the top of the stacked bar chart. Can you check and let me know at what step it is failing? Hi Jason! Thank you for your article. I am working on SSRS 2008. Is there any way to add a line graph in range bar graph? It is possible with range column but not work with range bar.